Susan Sontag in her essays ‘On Photography’ talks much about the tyranny of photographic pictures and how they become a short cut to describing a reality. People always want a photograph because they can supposedly capture and record faithfully the nature of a place, people or an event. She argues that photographs don’t do this and are just as subjective in their recordings as other art forms by what a photograph chooses to keep in or out of it’s frame. She goes onto argue that words, both directly and indirectly, are a better tool for description. In the book, much of which talks about specific photographs and photographer’s work, she makes the point by not including any of these photographs to illustrate the points of her text. None. I understand what she argues when I post the photograph above of our camp at Chowilla Game Reserve. It tells you nothing really of the magic of the place and the difficulty of cycling for two days on dirt roads to get there. 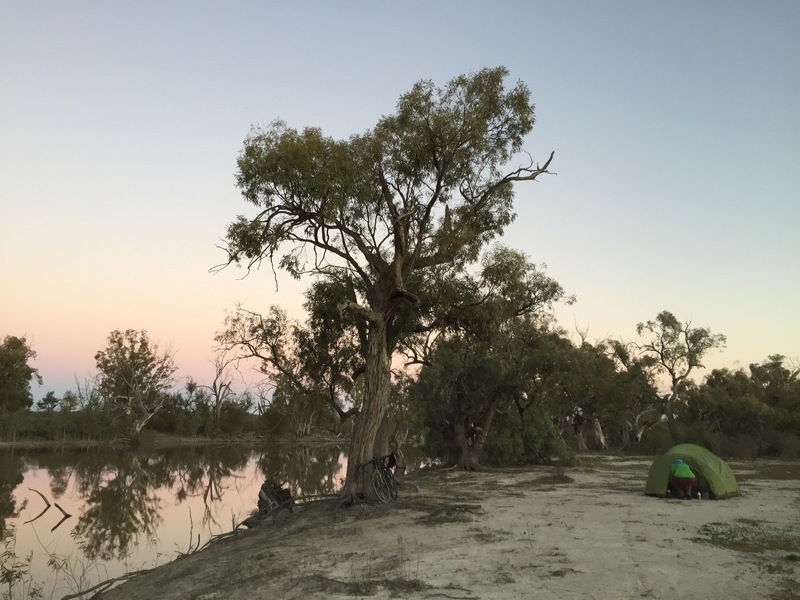 Or the fact that we stayed there at all was only because the town of Renmark became to far to reach and luckily we’d been carrying enough water to sleep out another night. The photograph does not capture the cool scent of the creek and mud, the dryness of the bank on which we camped and the absolute silence broken only by occasional bird song and frogs. As it became dark the moon came out casting long blue shadows and the stars Venus, Jupiter, Mars and Saturn appeared marking the line and arc of our universe in the sky above us. In the night we could hear Emus running about and the splashes of water fowl in the creek. The photograph describes something but nowhere near all of the beauty of the place we found ourselves sleeping in. That’s me getting into the tent!